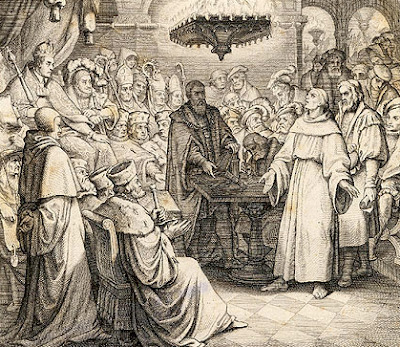 By the spring of 1521 a 38-year-old theology professor from a tiny university town in Saxony Martin Luther had surprisingly become a powerful and popular voice of reform—much to the chagrin of both the secular and the ecclesiastical authorities throughout late Medieval Europe. The situation was more than a little distressing—and threatening—to the authorities. So it was that Marin Luther was summoned to the city of Worms to recant his dangerous views by the young Hapsburg Emperor, Charles V.
"Since your majesty and your lordships desire a simple reply, I will answer without horns and without teeth. Unless I am convicted by Scripture and plain reason—I do not accept the authority of popes and councils for the have contradicted each other—my conscience is captive to the Word of God. I cannot and I will not recant anything, for to go against conscience is neither right not safe. Hier stehe ich, Here I stand, I cannot do otherwise. God help me. Amen." His boldness recalled a much earlier stand, that of Peter and John before “the rulers and elders and scribes who gathered together in Jerusalem, with Annas the high priest and Caiaphas and John and Alexander, and all who were of the high-priestly family.” When this council was convened, the leaders asked the disciples, “By what power or by what name” did they proclaim their Gospel and perform their good works?